Everyone watched the eleventh stage of the Giro d'Italia today in amazement as 56 riders split off of the front of the peloton at kilometer 20 to take a maximum advantage of close to 20 minutes over a group that contained several of the pre-race favorites. Fast-forward 242 rainy kilometers and the front group saw Evgeni Petrov (Katusha) ride away on the climb to the finish to take the stage win, with Carlos Sastre (Cervelo TestTeam) crossing the line seconds later having ridden new life into his bid for the Giro d'Italia crown. The 26-man group that was left behind contained race leader Alexandre Vinokourov, BMC Racing’s Cadel Evans, Ivan Basso and Vincenzo Nibal from Liquigas-Doimo, Marco Pinotti (Team HTC - Columbia), Vladimir Karpets (Team Katusha), Stefano Garzelli (Acqua & Sapone), Damiano Cunego (Lampre-Farnese Vini) and Michele Scarponi (Androni Giocattoli). They all lost more than 12 minutes by the end of the stage, and now trail Sastre with all but one of the Tour’s mountain stages in front of them. Vinokourov said that it was Astana, Acqua e Sapone and BMC Racing that initially took up the chase, but when the Liquigas-Doimo team of Basso and Nibali refused to help, all three stopped working. It was at that point where the Italian team likely gave away the Giro. The Kazakh is a question mark going into mountains on tap for the final week, so he made the decision to let the others work it out. "I felt that nobody wanted to start the chase, and it shouldn't be me who they look at to do even more [work],” explained Vinokourov. “I wore the pink jersey for five days, and riders like Basso and Nibali are more likely to win the Giro than me." With a battered team that’s now down to five, world champion Evans was short the firepower even after calling Brent Bookwalter back from the front group. "It's difficult to come back on 60 riders when you only have a group of 26 chasing," BMC Racing Team Director Sportif John Lelangue said afterwards. With what has been an unpredictable Giro d’Italia so far, he remains optimistic. "The Giro is still a long ways to Verona," Lelangue continued. "We are only halfway. The big week of mountains is coming Saturday. So it's still open - even if it will be difficult. Anything is possible. Look at the race today." The biggest losers were Basso and Nibali, who went into the day with two solid threats for the overall. Basso is only concerned about one rider now, and that’s Sastre. If anyone deserved a break, he believes it was the Spaniard. "In truth, the only man of that break that is dangerous is Carlos Sastre, but if anyone deserved to be there, from the bad luck he has had in this Giro up until now and his tactical ability, it was him," Basso admitted. Richie Porte pulled on the maglia rosa today, but isn’t expected to hold it through the mountains. 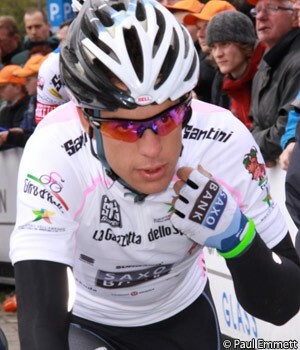 He’ll enjoy his time in pink, and should hold on until the weekend’s mountain stage. This Giro d’Italia has proven that anything is possible, so maybe the young Australian can hold onto it a little longer. Tomorrow’s 191 kilometer stage should finish in a sprint, but it’s anybody’s guess.